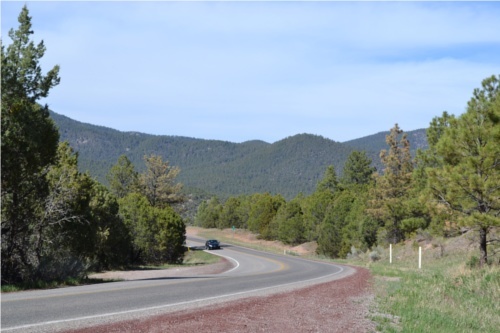 It’s late May and the weather is getting steadily warmer, trees are leafing their spring green, and it’s time to hit the High Road to Taos, stay overnight, take the Low road (Route 68) on the way back to Santa Fe, and discover a few great historical and cultural treasures along the way. Many areas of New Mexico offer authentic experiences for us avid time travelers who wish to drop the shackles of high-speed everything and remember a simpler time and lifestyle. The Scenic High Road is one of the best! 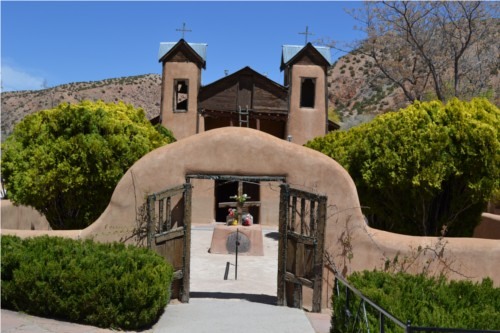 Only a thirty minute easy drive from Santa Fe (along the 285, to the scenic 503, and left on route 98), Chimayo, with its beautiful Santuario, sits quietly amid the early sprouting elms and cottonwoods, as it has since 1816. 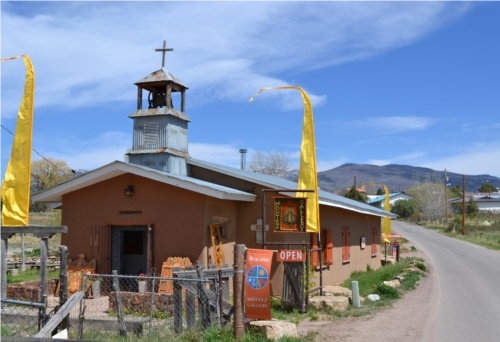 Making a left at Junction 76, I take a short half-mile detour to visit John Abrums’ Chimayo Trading & Mercantile and his extensive collection of authentic Native American arts. 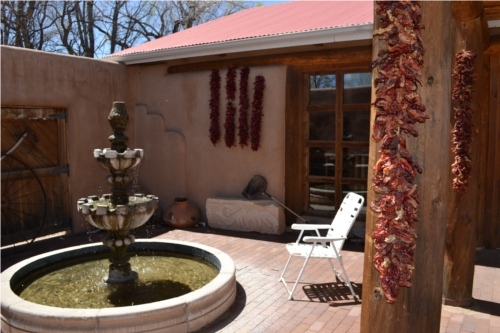 His patio is inviting on this warm day with its fountain and chile ristras. 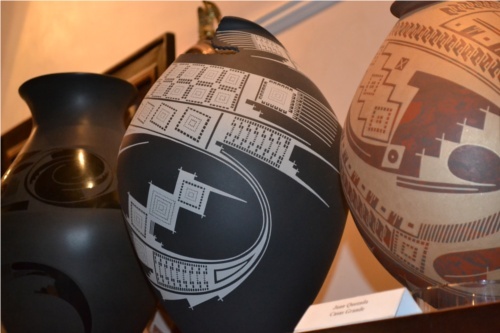 For over twenty-five years, John has collected some of the finest examples of historic and contemporary fine art, pottery, jewelry, baskets and weavings by premier Native American artists from all over the Southwest. His pottery collection alone includes works from the Pueblos of Santa Clara, San Ildefonso, Ohkay Owningeh, Casas Grandes and Mata Ortiz. Back on The High Road and heading north, there’s Centinela Traditional Arts and Oviedo Carvings and Bronze, just two of the seventy or more artists and artisans that inhabit The High Road. In 1998, the artist communities of the historic land grant villages of Chimayó, Córdova, Truchas, Ojo Sarco, Las Trampas, Chamisal, Peñasco, and Vadito got together to form The High Road Artisans Group. Their mission is to preserve and sustain the longstanding, self-sufficient lifestyle and livelihood of the villages en route to Taos. They are doing a great job of keeping the area simple and pristine and seemingly unfettered by modernity. The whole area captures the essence of rural New Mexico from a time long past, with views reminiscent of Swiss Alpine meadows. 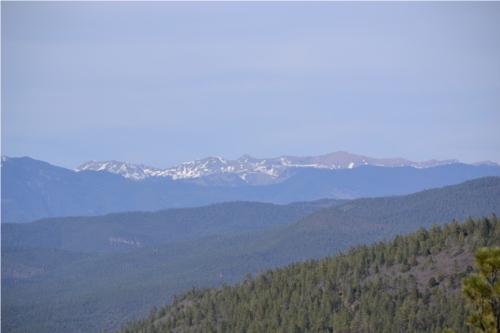 The Truchas Peaks are some of the highest in the New Mexico Rockies at 13,101 feet. Precambrian quartzite forms their core. 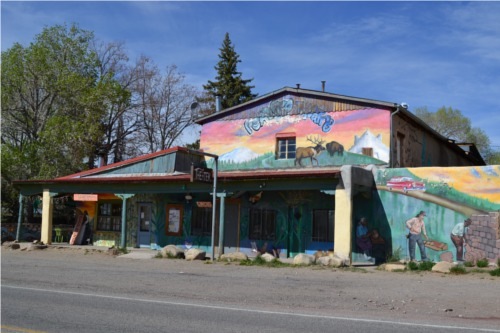 At an elevation of 8,000 feet, the tiny village of Truchas (Spanish for trout) is an active artist community with many homes and galleries welcoming visitors to drop in and see beautiful original artworks. Trish Booth’s Ghost Pony is one of the first galleries on the left as you enter the village. 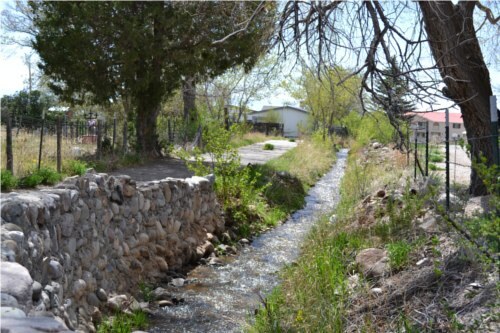 …and the racing acequia that draws from the Truchas River and rushes to irrigate those “Milagro Beanfields” and other farm crops the area is known for. 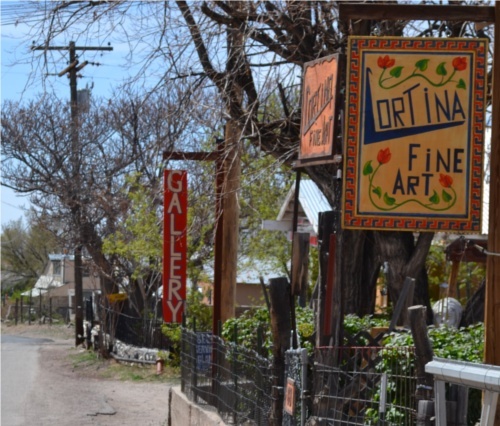 There are many galleries open year-round, including Hand Artes, Cardona Hines, Cortina, and others whose welcome signs you see as you cruise along the main road. But as the summer approaches, like colorful blossoms, more open up. And you must remember the last two weekends in September when the autumn colors are highlighted by the Annual High Road Art Tour. 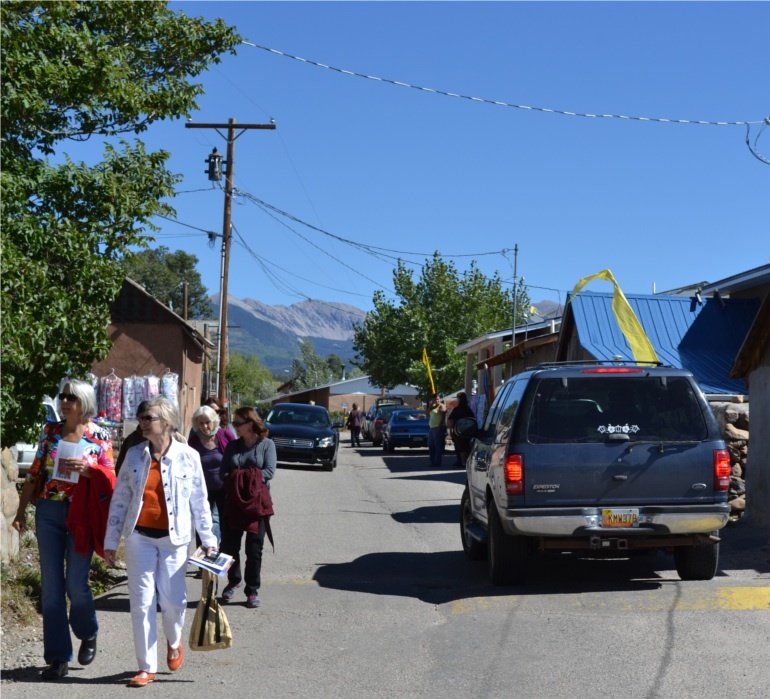 Back on 76 and continuing toward Taos, there’s the artists’ co-op, The High Road Marketplace. 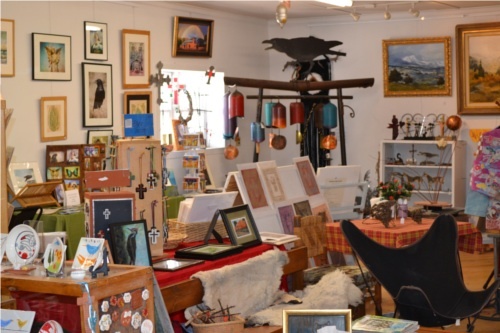 It is open every day, year-round, and offers a varied selection of arts and crafts from along the High Road. I could spend hours browsing the many unique treasures. 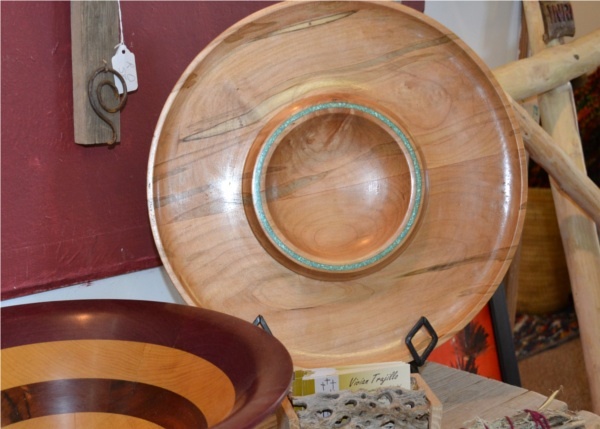 I love this wooden serving bowl with turquoise inlay. 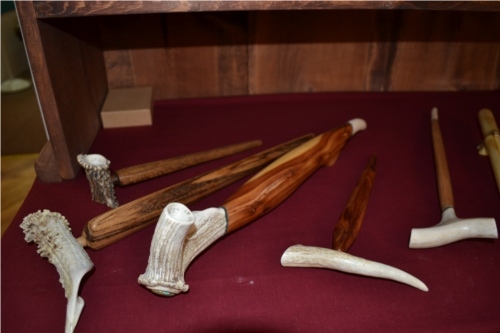 I’m not a smoker, but I couldn’t help falling for the artistry of these pipes made of wood and elk horn. Before heading out of Truchas, I stop in at a relatively new gallery just past the Market Place. Joan Zalenski’s OffCenter Contemporary Fine Art and Photography welcomes visitors everyday from 10a.m. – 6p.m. and by appointment when you call ahead (505) 689-1107. Joan’s work is beautiful and she’ll even serve up a cappuccino or espresso as you enjoy your surroundings. I move on toward Taos, knowing there are more treasures ahead. 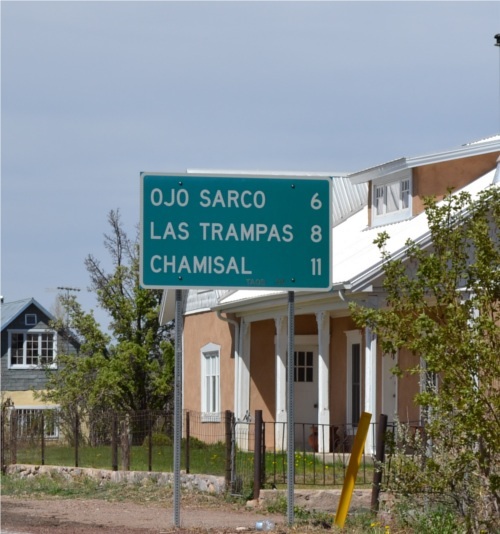 The village of Las Trampas (locally referred to as Trampas) was established in 1751 by twelve families from Santa Fe. At that time much of northern New Mexico was uncharted, and Spanish settlers risked being raided by Native tribes, such as the Comanche, Apache and Ute. Despite the dangers, seventy-four-year-old Juan de Arguello led the families to the land he had been granted by the first Governor of New Mexico, Tomás Vélez Cachupín. The church is now a National Historic Landmark, and the entire village is registered as a National Historic District. The church interior is usually only open on Friday and Saturday – donations are appreciated. The High Road is lined with tall pines as it continues to wind through the mountain valley. 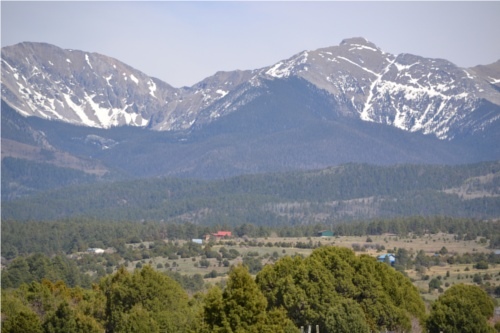 And the views of Taos’ mountains invite me ever onward to The High Road’s end. The entire 70-mile drive can be done in as little as an hour and a half, if you’re in a rush. But The High Road isn’t meant to be rushed and when you’re stopping as much as I did, it’s best to allow at least half a day, about 3 – 4 hours. 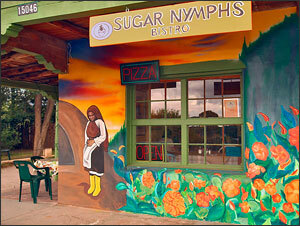 The Sugar Nymphs Bistro alongside the Peñasco Theatre is a colorful and tasty roadside treat. 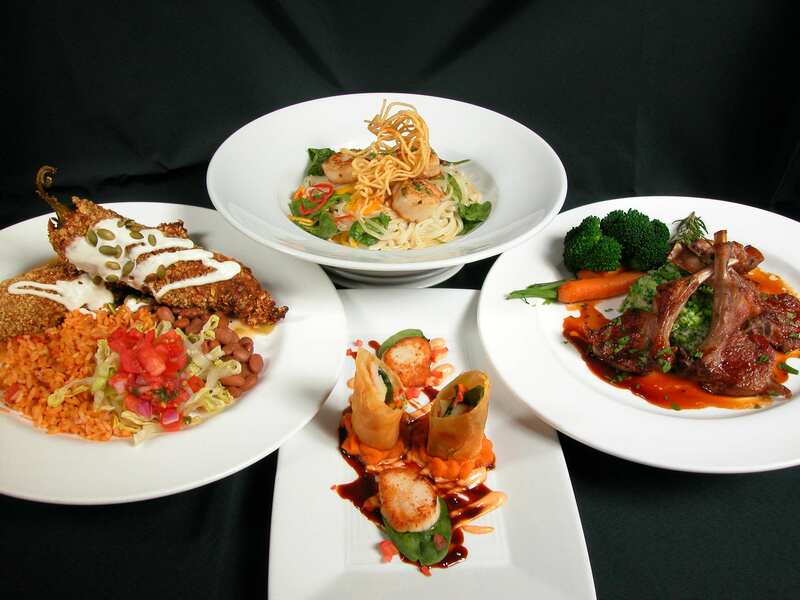 The bistro is open for lunch, brunch and dinner. But different seasons call for different hours, so it’s best to give them a call first if you want to be sure of a table. (575) 587-0311. The Peñasco Theatre, hand-built in the early 1940s, now serves as a community hub that offers year-round arts programs, and aerial trapeze acts, music, and one-of-a-kind theatrical pieces through the summer season. They are also home to an aerial trapeze school for adults and children. (575) 587-2726. Traveling through this creative little town, I keep my eyes open for the many jewels embedded alongside and nearby its main thoroughfare. There’s the Gaucho Blue Fine Art Gallery, which carries a wonderful variety of works from local artists of the area (575) 587-1076. Marx Contemporary, Art For The Heart Gallery, and Walking Woman Gallery are a few other treasures, situated across from the Peñasco Post Office. 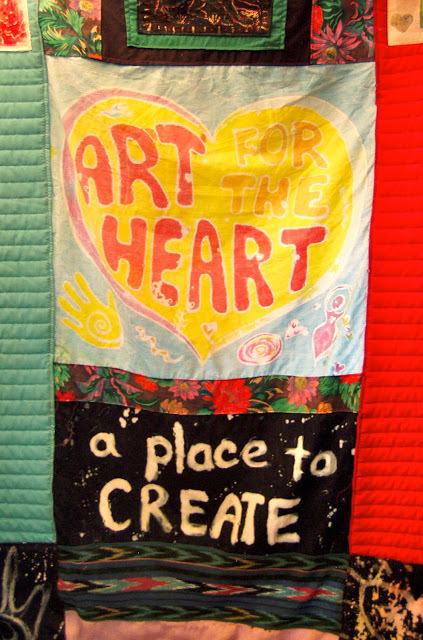 Art For The Heart is a nonprofit project of the Mountain Ambulance Service, offering a walk-in art space with materials you can use to create your own work, and a lovely array of unique folk, fine and wearable art from as many as twenty five local artists. They also have a beautiful garden where folks can sit awhile and take in the summer’s blooms. They are open Thursday through Sunday 11am – 5pm, or by appointment. 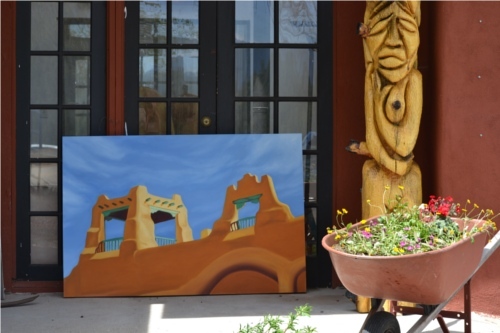 This would be a great place for a small group of friends of any age wanting to soak up some Peñasco art and charm to create their own pieces of High Road Art. Call Founder Jean Nichols to find out more (505) 417-0155. Sipapu Ski and Summer Resort is just a few miles away where the river runs through town, and although there’s plenty more to see and write about, it’s time to get settled for the evening. Arriving in Taos around 5.30 pm, I check in at El Pueblo Lodge. I’m traveling with my quadruped best friend and El Pueblo caters nicely to those of us with dogs. A warm, friendly place with lush, shaded, grassy grounds, and southwest charm throughout. 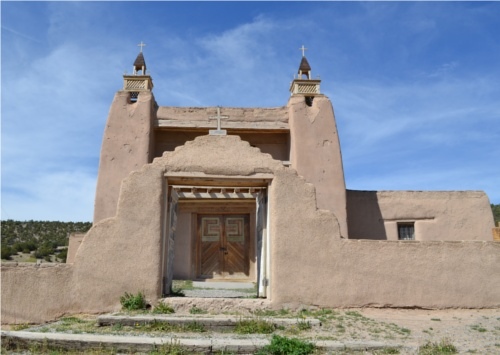 They are located just a mile from the Taos Pueblo and a short walk from the historic Plaza on the main vein through town, Paseo del Pueblo Norte. A scrumptious dinner at Doc Martin’s Restaurant, located in the Historic Taos Inn, satisfies the gaping hunger I’ve conjured up during the drive. No, I didn’t eat all these meals, but thought it a good idea to show you how diverse and delicious their food is. There are plenty of unique activities, museums and galleries to experience in Taos. 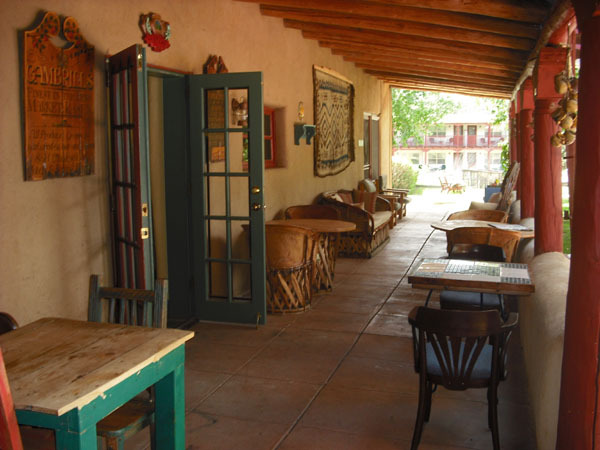 Of course, the Taos Pueblo is a must, and I enjoy Wilder Nightingale Gallery, and Chimayo Trading Del Norte, the Blumenschein, La Hacienda de los Martinez, and others. For activities, there’s the wonderful experience of llama trekking with Wild Earth Llama Adventures, or if you visit in winter they offer snowshoeing tours (llamas don’t trek the snowshoeing tours). Here’s a link to a Taos Day Trip Guide with more detailed information on these and other ideas for your visit. My return journey to Santa Fe is along the Rio Grande River Valley along route 68, sometimes referred to as the Low Road. It offers more stunning views and special finds. 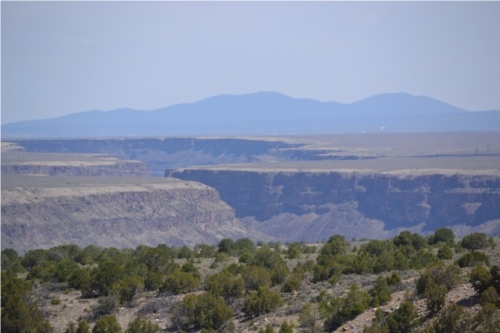 Today, there’s a slight haze in the air turning the mountains and Rio Grande Gorge many shades of blue. 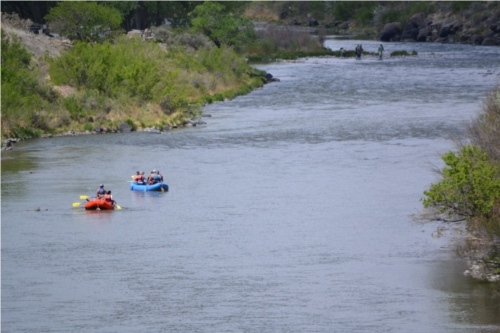 Starting around April 20th and through August is the perfect time to raft the Rio Grande. Their rigs are ready and a fresh bus load of eager rafters wait to board. 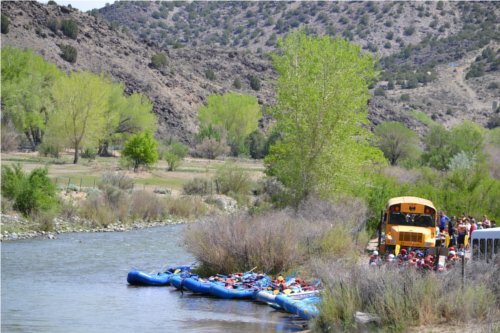 Kokopelli Rafting Adventures are my favorites for rafting or kayaking the New Mexico and Colorado rivers. Of course the earlier you go, the higher the water and the bigger the rapids. 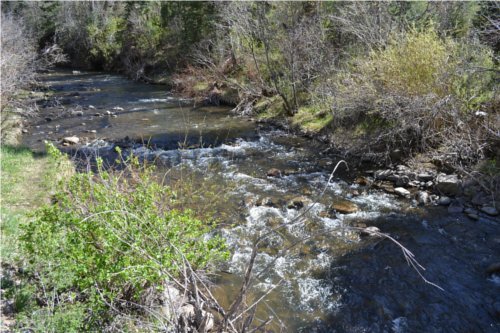 The Taos Box is the highest part of this particular tour, where the water is more active during the early season. The lower stretch is called Racecourse and is a popular half-day ride. As the water lowers throughout the season, the challenge shifts from high water riding to rock navigation, which is also a lot of fun. And there’s plenty of nice easy cruisin’ to be done in between. The road follows this stretch of river through the canyon and there are many stopping points to enjoy along the way. After about 27 miles I arrive in Velarde and stop in at Black Mesa Winery to say “Hi” to owner Jerry Burd. The vines are sprouting beautifully in the spring sun. 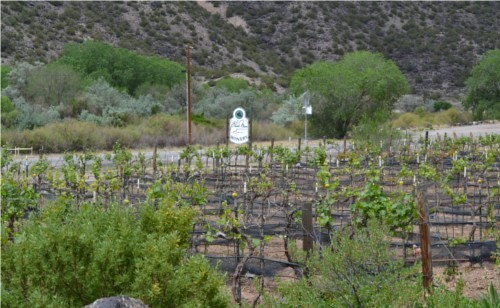 Black Mesa is well-known for their many delicious wine options, among them Pinot Grigio, Syrah, Montepulciano, and Riesling. A signature wine of theirs is the ever-popular Black Beauty, a red wine with a dark chocolate taste…mmm! Folks love to visit and sit in the shaded wine garden sipping their faves. Whichever route you choose to get to and from Taos, you won’t be disappointed – there’s so much to discover along the way. And don’t be put off by winter either. Though there may be snow on the mountains, the roads are generally clear and the views are gorgeous!! REMEMBER: The High Road Arts Tour is EVERY year during the last two weekends in September. The fall colors are peaking, and over 70 artists open their studios to you! It is great to be out in the clear fall weather, strolling historic villages and looking at beautiful fine art and crafts. If you need help planning your visit to the northern New Mexico area, please call me at (505) 470-2991 or write an email with questions to: info@santafeselection.com. I offer free suggestions and trip advice based on my 24 years living in this enchanting area. 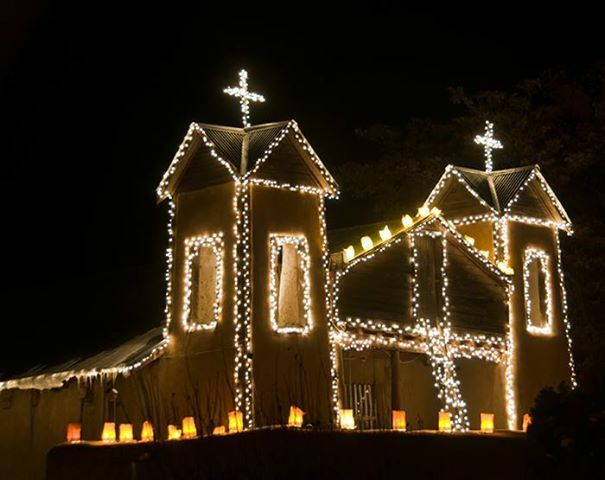 For more information on The High Road and other authentic experiences in Northern New Mexico please go to: http://www.santafeselection.com/home.php. This is one of the best travel reports I’ve seen, Since I live on the High Road, and participate on the H.R.Tour, I feel great pride when I see the people in my home community thrive. Wonderful article on the high Road. Thanks so much, from those of us who live and have businesses here. The High Road is the best way to experience the true essence of life in New Mexico, off the beaten path of the more commercial areas. If you want to really experience the “land of Enchantment”, take the High Road! Very detailed plan. I love it. I’ll use this as a guide for our October visit! Thank you so much for referencing SantaFeSelection.com and my blog. I’m happy to help with any other ideas for your visit. Please feel free to call or write. Have a terrific visit to our lovely area!! Best Wishes, Maria Johnson, SantaFeSelection.com Travel Guide & Concierge. 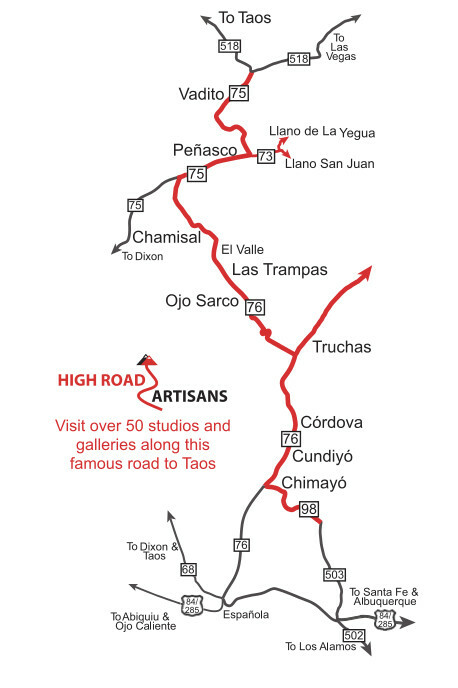 Just read your very interesting article on high road to Taos. As we are in the UK It is very helpful as we are visiting the area from Santa fe end March and particularly want to see the church at Chimayo and get to Taos if there is no snow on the roads. HI Jean, Thanks for reading my article, and for your comment. 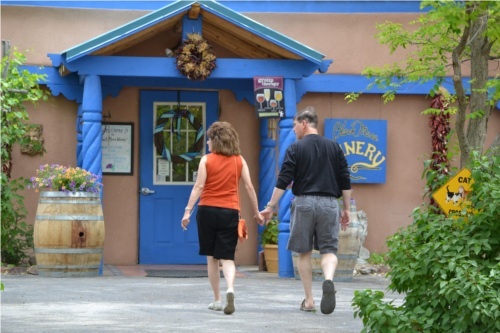 You’ll find more helpful info for your visit to the Santa Fe area on our Travel Guide site, SantaFeSelection.com, it will help you find lodging, restaurants, museums, unique shops and more. If I can be of help in answering questions or planning your itinerary to make optimum use of your time here, don’t hesitate to call or write. (505)470-2991 or email info@santafeselection.com. Thank you for the wonderful guide and your mention of Montez Gallery. Since 1989 we have represented the saint-makers of Northern New Mexico and Southern Colorado, both past and present. Thanks to kind folks like you, we continue to be supported and exposed to a large audience. Thanks again Maria Johnson for your amazing guide, as one of the artists showing on the High Road Tour. Your support means a lot for all of us living here.